For more than a year they only had the TapGestureRecognizer. Although they did add some others lately, they still don’t provide all information which you need. Furthermore the API which they use has been copied from iOS and is not what a .NET developer would expect. MR.Gestures tries to close that gap. It adds Down, Up, Tapping, Tapped, DoubleTapped, LongPressing, LongPressed, Panning, Panned, Swiped, Pinching, Pinched, Rotating and Rotated events to each and every layout, cell and view and to the ContentPage. These events will be raised when the user performs the corresponding touch gesture on the element. In the EventArgs passed to the handlers you can see exactly what happened. You can work with the touch gestures completely from the .NET Standard / PCL project. The platform specific code is all done in MR.Gestures. If you just want to see how it works, then download the free GestureSample app from GitHub. In this app you can see how all the elements use all events. You can change the code however you like, add break points and see what it does. You will find all the examples from here in the GestureSample and many more. And now you can use the new elements from the namespace MR.Gestures. All the elements which are usually in the Xamarin.Forms namespace can also be found in MR.Gestures. But those have additional event handlers and command properties. Adding the event handlers works the same way as in standard Xamarin Forms or WPF controls in both XAML and code. or by assigning the method as a handler. 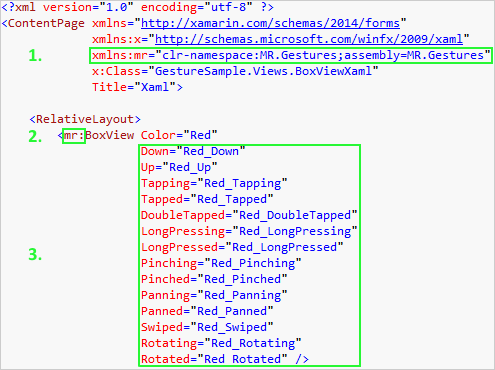 But IMHO if you really want to separate the view from any code, then the view should be in XAML. So instead of the event handlers you can also use commands in your view model and bind them to the respective properties. The properties for the commands are called like the events, just with Command appended. You can also define a parameter passed to the command with the *CommandParameter properties. If you suppress the CommandParameter, then the respective event args are passed to your command. In this case a MR.Gestures.LongPressEventArgs object. For the Tapped, DoubleTapped and LongPressed events you may not need the event args and defining a CommandParameter could make sense. But for the more complicated events you will always need the event args or you won’t know what happened. E.g. it does not help to just know that an element has been swiped unless you also know in which direction. The Direction is contained in the SwipeEventArgs. You can bind the commands in code too. The syntax for binding in code is a bit complicated, therefore my favorite is using commands in XAML. You will also see this, when you look through the code in the GestureSample. Although there are samples in all these categories, most of them are written in XAML and bound to commands. MR.Gestures is licensed per app name. If your app has the same name on all platforms, you only need one license key. If you have hundreds of developers working on the same app, you only need one license key. If you have different versions of your app with different names (e.g. different languages, customized for different clients or free and pro), then you need a separate key for each version. The license will be valid forever. You don’t need to refresh it every year. The price for one license is EUR 40,00 (+VAT). The payment process will be handled by MyCommerce. You will be forwarded to their site when you click the Buy button. Please enter the EXACT name of your app. This is NOT the bundle name. If you write it in lower case or append any whitespaces, it won’t work either. See the FAQs on how to configure it. Once you purchased a license, instructions how to configure it will be displayed on the MyCommerce page. These instructions can also be found in the email they will send you and in the FAQs. If you forget to configure the license key properly, then all the events will still be raised, but the properties of the EventArgs will be empty. That may be enough for the tap and long press events, but not for the more complicated ones. You can handle fourteen different events with MR.Gestures. Down One or more fingers came down onto the touch screen. Up One or more fingers were lifted from the screen. Tapping A finger came down and up again but it is not sure yet if this may become a multi tap. Tapped There was no second tap within 250ms so this was a single tap gesture. DoubleTapped There have been two Tapping events within 250ms and no more came. LongPressing A finger came down on the screen and did not move. The finger is still down. LongPressed The finger was released and the gesture is finished. Panning A finger came down and is moving on the screen. This is also called a dragging gesture. Panned The finger left the screen while it was moved slowly or not at all. Swiped The finger left the screen while it was moved fast. On Android and Windows Phone this is also called a flick. Pinching Two fingers hit the screen and are moving towards or away from each other. Pinched The fingers left the screen. Rotating Two fingers hit the screen and are rotating on the screen. Rotated The fingers left the screen. The -ing event is raised when at least one finger is on the screen and a gesture is in progress. The -ed event is raised, when the gesture is finished and all fingers left the screen. Your event handlers will receive one of seven different EventArgs objects with all the detailed information what happened. Click on the class names to see all its properties. int TriggeringTouches The indexes of the fingers which were lowered/raised. Their locations are in Touches. bool Cancelled Android and iOS sometimes cancel a touch gesture. In this case a *ed event is raised with Cancelled set to true. bool Handled This flag is meant to be used for event bubbling, but it does not work yet. int NumberOfTouches The number of fingers on the screen. IGestureAwareControl Sender The element which raised this event. Point Touches Returns the position of the fingers on the screen (and in Up the last position before they were lifted). Rectangle ViewPosition The absolute position and size of the Sender on the screen (window on desktop). int NumberOfTaps The number of taps in a short period of time (~250ms). Point Touches Returns the position of the fingers on the screen. long Duration Duration of long press in milliseconds. Point DeltaDistance The distance in X/Y that the finger was moved since this event was raised the last time. Point TotalDistance The distance in X/Y that the finger was moved since the pan gesture began. Point Velocity The velocity of the finger in X/Y. Direction Direction The direction in which the finger moved when it was lifted from the screen. This is one of Left, Right, Up, Down or NotClear. Point DeltaDistance The distance in X/Y that the finger was moved since the last Panning event. Point Center The center of the fingers on the screen. double DeltaScale The relative distance between the two fingers on the screen compared to the last time this event was raised. double DeltaScaleX The relative horizontal distance between the two fingers on the screen compared to the last time this event was raised. double DeltaScaleY The relative vertical distance between the two fingers on the screen compared to the last time this event was raised. double Distance The distance between the first two fingers. double DistanceX The horizontal distance between the first two fingers. double DistanceY The vertical distance between the first two fingers. double TotalScale The relative distance between the two fingers on the screen compared to when the gesture started. double TotalScaleX The relative horizontal distance between the two fingers on the screen compared to when the gesture started. double TotalScaleY The relative vertical distance between the two fingers on the screen compared to when the gesture started. double Angle The angle a line from the first to the second finger currently has on the screen. double DeltaAngle The angle the fingers were rotated on the screen compared to the last time this event was raised. double TotalAngle The angle the fingers were rotated on the screen compared to the start of the gesture. Some elements need to listen to some touch gestures themselves to work properly. Depending on the exact implementation by Xamarin and the native platforms, these events may be consumed. Some of the views are simply too small to be touched. Therefore the gestures are also not forwarded to us. When I tested the GestureSample with WPF the same happened again as on macOS; I found a bunch of very serious bugs. I filed them, they were acknowledged, but only one has been fixed yet. The bug which you see at once in the GestureSample is #3271. The transformations from TranslationX/Y, Scale and Rotation are applied in the wrong order. So when you rotate an element by 90° and change TranslationX, then the element is moved vertically instead of horizontaly. Also when you set Scale to 2 and TranslationX to 100, it will be moved by 200. This bug has been fixed, but the fix has not been released yet. I don't know, which Xamarin.Forms version will include it. Down, Up, Tapping, Tapped, DoubleTapped, LongPressing, LongPressed, Panning, Panned and Swiped can be triggered with the mouse. For Pinching, Pinched, Rotating and Rotated you need a Trackpad and two or more fingers. Panning, Panned and Swiped can also be triggered with the Trackpad with two or more fingers. As the Trackpad has coordinates of its own which are not related to the touched view at all, the Points in Touches work a bit different then on the other platforms / using the mouse. When I returned the coordinates of the Trackpad (which is recommended by Apple), the values were very small for Pan gestures. So I added MR.Gestures.MacOS.Settings.TrackpadCoordinateRatio and multiply all coordinates by that setting. The default is 5/5, but you can change it however you want to get bigger or smaller values for the Touches. Apple also doesn't use the same coordinate system in MacOS as every other computer on earth. They have the 0/0 point at the LOWER left. So keep this in mind when you work with the view, touch or other coordinates. Most likely you'll have to do some different logic on the Mac than on the other platforms. Fortunately this is consistent with Xamarin.Forms.VisualElement.TranslationY and other Y coordinates. There's also a bug in Xamarin.Forms.MacOS. Their PageRenderer and ScrollViewRenderer don't have virtual methods OnElementChanged and OnElementPropertyChanged to override. Therefore I cannot hook into those elements' touch handlers. I submitted a PR to Xamarin in October 2017 and they merged it into master, but almost 10 months later it is still not included in XF 3.1. Here are all the elements and how they work in detail on each platform. Hover over any yellow or red icons to see the details. All events are fully supported. Some events do not work fully. Hover for details. No events are raised. Hover for details. [Androis, iOS, WPF] fix for DeltaDistance, TotalDistance and Velocity have been 0/0 when Panning was raised the first time. 1.5.4 [Android, iOS + Mac] fix ViewPosition coordinates. [UWP] LongPressed was only raised when also watching LongPressing. 1.5.3 [Android] revert to old code to retrieve the app name, no changes to AndroidManifest needed. 1.5.2 [Android] use new constructors for the Android renderes introduced in XF 2.5, fixes a bug when using a MR.Gestures.Frame. 1.3.5 Fixes a bug with LongPressing/LongPressed on some Android devices. 1.3.4 Added an internal constructor which Mono Droid needs to instantiate Java objects. 1.3.3 Worked around an issue when a NullReferenceException was thrown when I read a dependency property. 1.3.2 Worked around an issue when the renderers' Dispose method was called after Element was set to null. 1.2.5 Support for multiple fingers in Tapping, Tapped, DoubleTapped, LongPressing and LongPressed on Android. 1.2.2 Fixes a bug where the gestures were not properly reset if you handled Panning but not Panned, Pinching without Pinched or Rotating without Rotated. 1.2.1 Fixes a bug on Android. A ScrollView with Orientation="Horizontal" did not scroll. 1.0.7 Fixed a bug where events on Cells on Android phones were raised too often. How do I configure my license key? As your app name can be different on each platform, the license key must be configured in all platform specific projects. The best place for it is in each project between the calls to Xamarin.Forms.Forms.Init(...) and LoadApplication(new App()). In UWP you add the code to the OnLaunched method in App.xaml.cs. How do I configure my app name? The name of the app has to be configured differently on each platform. In the Android project open MainActivity.cs. The MainActivity class should have a Activity attribute. The Label parameter is the app name. If you configured your activity manually in the Properties / AndroidManifest.xml file, then you need to change the android:label attribute there. In Visual Studio open the iOS project properties and go to the “iOS Application” tab. There you’ll find the “Application name”. If you don’t have a “iOS application” tab, then open the info.plist. The app name is in the CFBundleDisplayName or CFBundleName setting (should be the same if both are present). In Xamarin Studio the “Application name” is the very first textbox when you open the info.plist file. Here you need to open the Package.appxmanifest file in your platform project. On the “Application” tab change the “Display Name” and on the “Packaging” tab the “Package display name”. In Visual Studio for Mac open the MacOS project options and go to General / Main Settings. You need to set the “Name”. How do I install MR.Gestures? You can install it with NuGet. In Visual Studio for Windows the easiest way is to right click your solution and choose “Manage NuGet Packages for Solution…”, then search for MR.Gestures and install it to all projects which use XF. On the Mac you need to install the package for each project separately. I already released the GestureSample app with complete source code on GitHub. That app shows how to use MR.Gestures with each and every available element. If you want to try it in your own app or the final name of your app has not been decided yet, you can simply call your app GestureSample and use the LicenseKey from that app. My event handler is called, but some event arg properties are not set. You did not set the LicenseKey properly or it does not match your app name. Please check if you set the correct LicenseKey in all platform specific projects and that your app name matches the key. In MR.Gestures 1. * the LicenseKey needed to be set properly for these events to be raised. Without LicenseKey the NumberOfTaps is always 0. Tapped was only raised if NumberOfTaps was 1 and DoubleTapped only if it was 2. With version 2.0 these events are also raised without LicenseKey (although NumberOfTaps is still 0). What’s the license agreement of MR.Gestures? MR.Gestures is a library to be included in others apps. So Yes, with the license I grant the right to use MR.Gestures in your own app, no matter if it’s commercial or free. I wrote MR.Gestures myself and I hold all rights on it. I do not grant the right to tamper with the library in any way, decompile or resell the whole or only parts of it. MR.Gestures is licensed per app name. I.e. if your app has the same name on all platforms, you only need one license key. If you have different versions of your app with different names (e.g. different languages, customized for different clients/environments or free and pro), then you need a separate key for each version. You can use it for as many developers on as many computers for as long as you like. I want to swipe with two fingers. How can I handle that gesture? The native standard gesture recognizers only work with the standard amount of fingers. I.e. two fingers for pinch and rotate and one for the others. I managed to get some gestures on some platforms running with more fingers, but this is not consistent over all platforms. In the future I may use a different API which is nearer to the wire. But this is a very big change so I’m not sure if I’ll do that yet. I try to move/zoom/rotate an element, but it jumps on the screen. The Touches coordinates in the EventArgs are always relative to the View which handles the event. If you manipulate the TranslationX, TranslationY, Scale or Rotation(X/Y) properties during a gesture, then the Touches and Delta* values cannot be calculated anymore. So you always have to listen to the events of a container element and manipulate those properties of a child. If multiple elements are nested within each other and they all handle the same events, this is called event propagation. Ideally you should be able to tell, which element should handle the event. When I wrote MR.Gestures, I also wanted to implement this. This is why I added the Handled flag to the EventArgs. Unfortunately I couldn’t get it working reliably on all platforms. Especially with some of the elements natively handling (and consuming) the events, this proved impossible to implement in a generic way. Therefore I decided to strive for a solution where all MR.Gestures elements raise the respective events. This way you can decide yourself, which element should handle it. The easiest way is to start a Timer in one handler and do your work unless another handler will be called within a given timeframe. The gestures do not work on cells on Windows. Xamarins Windows renderers (UWP and WPF) for cells do not provide anything I can hook into to add my functionality. So I had to add that functionality to the renderers for MR.Gestures.ListView and MR.Gestures.TableView. So if you want to listen to touch gestures on cells, the containing ListView or TableView must also be used from MR.Gestures even if you don’t add any gesture listeners on that element itself. I get “Could not load file or assembly ‘MR.Gestures’” or “Could not load type MR.Gestures…”. Please check your references. With version 2.0 all projects need a reference to MR.Gestures. In version 1. * the standard/portable project needs to reference MR.Gestures and the platform specific projects need references to both MR.Gestures and MR.Gestures.platform. Every Xamarin.Forms developer should be familiar with the procedure of closing Visual Studio, deleting all bin and obj folders manually and then trying again. I have a .bat file which does that. Cleaning the solution within VS or just recompiling fails to delete old files most of the time. Please also check, if you set your Settings.LicenseKey like it is described above. If this is not set, then the linker may strip it out of your executable. What data do you have from me and what do you do with it? I don’t collect any data from people who are not my customers. I also don’t send newsletters, so there’s no need to unsubscribe anything. If you buy a MR.Gestures license, then my distributor will collect all data which they need to process the payment. Once the payment is done, I receive an email with your contacts (technical and payment), app name and issued license key. I do not receive your credit card number or any other sensitive information. I keep this data for future reference in case anybody needs support from me. Also if you send me any emails yourself, I will keep those emails for future reference. You can request the deletion of these emails, but if I can’t find your data, then you’re no customer of mine and I may be slower with support requests. There is no cookie banner on this page, because it does not use any cookies at all. If you have any questions, suggestions, you find bugs or whatever, then please read this page again. If you can’t find anything about your problem here, than search in the thread in the Xamarin forum I linked below. open an issue in GestureSample/Issues. I use that for both the GestureSample itself and MR.Gestures.